I still remember when my brother and I were still very young, we used to share a room and sleep on a bunk bed. I was older so I was the one sleeping on the top bed. When the lights were out I would pretend to be a witch and scare him. Oh, he would cry so loud until our mom hears it. Of course I got scolded every time. I miss those times and I miss that bunk bed. That was a long time ago and now I have grand daughters and if you have been following this blog you know they are twins. 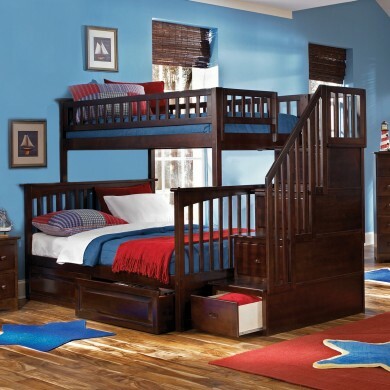 They are still too small for a bunk bed but their mom is already checking out several bunk beds for the twins' room. The room is not big so they can save more space with this bed. I am suggesting wood instead of metal because aside from the warm feeling it brings, wood can easily blend with other furniture. She already showed me her choices and I was amazed at how much bunk beds have changed. They now have drawers and some even comes with dressers. I found the loft tent bed really cute. It has a castle design with tents. 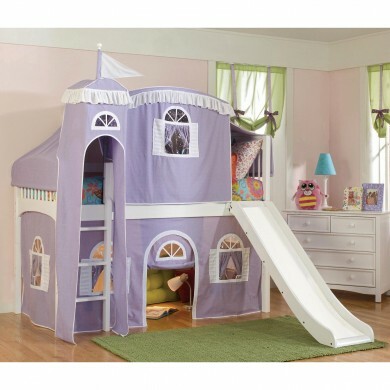 The girls will feel like princesses with this bed. Their mom is torn between the castle and the full stairwell bunk bed. Both beds look sturdy and have beautiful designs so it's really hard to choose between the two. But she still has a lot of time to think about that until the girls are ready for a bunk bed. how cute the bunk is!